The Porkies, the beloved mountains of the Midwest, are the scenic and rugged heart of the Porcupine Mountains Wilderness State Park in Michigan’s Upper Peninsula. This 60,000-acre park features entire rivers, 25 miles of Lake Superior shoreline, dozens of waterfalls, wildlife from bald eagles to black bears and the most extensive virgin forest between the Adirondacks and the Rocky Mountains. The Porkies also offer some of the best hiking in the Midwest. 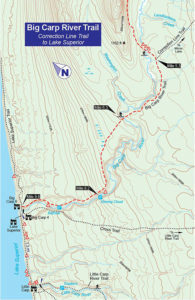 Dayhikers and backpackers have more than 90 miles of trails to explore plus 17 wilderness cabins and four yurts that can be rented in advance and 63 walk-in campsites. 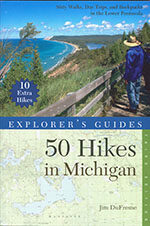 Hikes can range from a stroll to nearby waterfalls to a six-day trek that covers 40 miles. 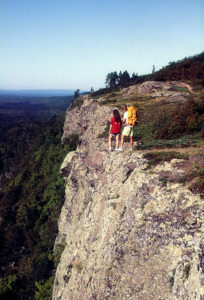 Hikers on the Escarpment in the Porcupine Mountains. 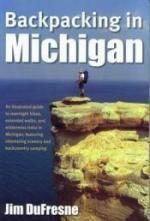 Porcupine Mountains Wilderness State Park: A Backcountry Guide for Hikers, Backpackers, Campers & Winter Visitors is the complete guide to Michigan’s largest state park. 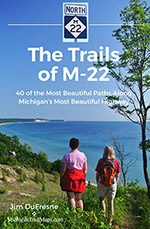 This fourth edition of Jim DuFresne’s classic is the best yet; a full-color, 176-page guidebook with 25 detailed maps that cover every corner of the park and stunning photography from well-known nature photographer Bryan Bynes. Porcupine Mountains Wilderness State Park covers the park’s entire 90-mile network of foot trails along with access, difficulty, hiking time and trail descriptions. 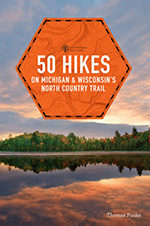 Backpacking itineraries, special chapters on the park’s waterfalls, mountain biking and fishing and descriptions of all 17 rental cabins, four yurts and campgrounds are included along with complete information on cross-country skiing, downhill skiing, snowshoeing and winter cabin rentals.